Influential Leadership Style – Think about your leadership style. Does it overpower or stifle creative thinking? Authoritative leaders get employees who merely agree (at least while they are in the room), because employees feel it’s an avenue for acceptance. Employees should feel comfortable enough to express their opinions and unique ideas. An organizational culture that fosters open-mindedness and values creativity sets a valuable precedent. To learn more about your style, take this Leadership and Emotional Intelligence Class on 10/28 with us! Drop Your Ego to Promote Problem-Solving – When employees ask you questions, change your perception that you must have (or do have) all the right answers. Drop your ego and provide opportunities for them to problem solve. Employees do not always need immediate answers, and will be much more successful and less dependent if they develop some problem-solving skills for themselves. Ask “What do you think would work?” “What do you consider a solid resolution here?” “Do you have some ideas to make this better?” Then recognize and praise their creativity, innovation, and problem-solving skills when they find the answers themselves. Change it UP! – Keep it fresh and new. Meetings don’t always have to be in the same place. Offices don’t have to look the same for years. All the chairs in the office don’t have to be identical. Change the décor. Get fish tanks. Get plants. Get art. People get bored with the same rituals every day and that prevents new ways of thinking. 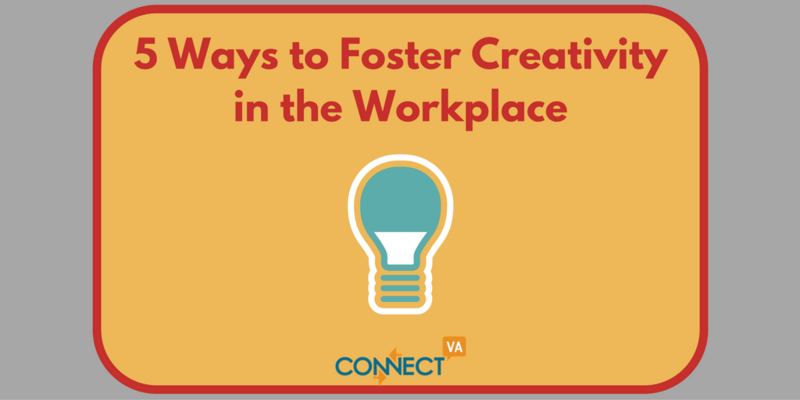 Create an environment that inspires creativity – bright colors, comfortable work areas, interesting art, quotes, articles, games, puzzles, sticky notes, dry erase boards, etc. If you want to find a place outside of the office, check out our Meeting Space page, which lists local venues who offer discounts to nonprofits or if you want to ask for some new décor, you might get a donation by posting your need in the ConnectVA Item Exchange. Contribute ownership – Ask employees for suggestions and solutions to the pressing issues of your organization, and give them credit for their ideas. Put the responsibility on them to create solutions. People will take more pride in their work if they have shared ownership. Employees are more engaged and happier if they feel they contribute in a meaningful way, leading to improved retention rates. Have fun – Recognize employees when they come up with creative resolutions to problems, and reinforce this behavior with rewards and encouragement. Provide incentives for employees who demonstration impressive problem- solving skills or creative ideas and efforts. Make it a game. A little competition among employees keeps things interesting, fun, and is highly motivating. Even implementing a few of these strategies will ensure that you and your employees will be happier and more productive. If you’re new to nonprofit management a great learning opportunity will be this Staff Supervision and Performance Management class on 11/7 & 11/8 or if you’re a new or aspiring Executive Director this ED/CEO Bootcamp on 10/28 & 11/2 to build your leadership capacity! Have leadership or other tips for nonprofit professionals or organizations? Send us a line – we may feature you in a “Nonprofit Tips” guest blog post! Email us at admin@connectva.org.